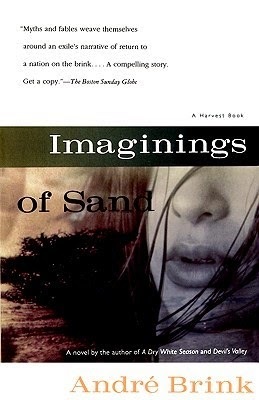 a book chick: "Imaginings of Sand"
my take: I love reading novels for a trip. My youngest son graduated high school this spring and family tradition dictates celebratory traveling. He wanted adventure so we headed to South Africa and I checked out some SA novels. This was an interesting blend of real and folk lore. The history of the treks is told through more of the imaginings ... an grandmother tells her grand daughter the family female history while South Africa experiences the days leading up to the first national vote. My one word summary of the book would be tumultuous ...a country's political change, a young woman's dis-ease with her past and her country, an old woman's life in the balance, a sister's unraveling marriage, and the hard scrabble lives of their ancestors...all swirling between past and present left me a bit breathless. Of the three I read for the trip, this was my least favorite, and I'm glad to have read it, nonetheless. my source: My fabulous South African friend, Michelle. see also: The Syringa Tree and Cry, The Beloved Country.